SOLD Yes, they did sterling jewelry for a short time and gold plated jewelry in the 1960s for a very short time. Finding a piece of either is close to impossible. Due to the scarcity, these pieces are considered very rare! 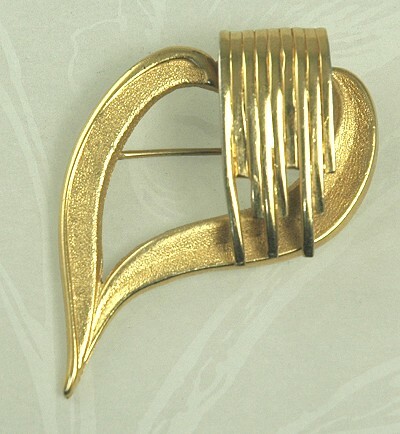 Here is a gracefully designed gold plated brooch that is a copy of their copper pin "MeadowBrook". It is very artistic and meant to reflect the era in which it was produced. There is a wonderful reference for the designs of this company in the book Copper Art Jewelry by Burkholz and Kaplan on pages 96 and 97. It shows sketches and the style numbers of many Matisse and Renoir pieces. The hallmark appears on the reverse. Condition: Excellent vintage. Measurements: 1 1/2" wide and 2 1/4" long.